Use these sample macros to remove pivot fields from the pivot table layout. Read the instructions for using the macros, then get the code from each section, or download the free workbook. NOTE: If some pivot tables are OLAP-based (Data Model), use these macros instead. The macros shown below will remove pivot fields from the pivot table layout. You can copy these macros to a regular code module in your workbook. Then, select a sheet that contains a pivot table, and run the macro. If there are multiple pivot tables on the sheet, these macros will affect the first pivot table only. 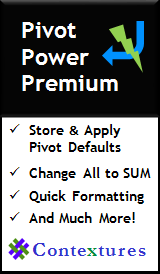 This macro will remove all the pivot fields from the pivot table layout. Be very careful if using this macro! Make a backup of your file first. The ClearTable command in this macro will also remove calculated fields, calculated items, custom items and grouping. This is a macro version of use the Clear All command on the Ribbon's Design tab. When you run the macro, if you see a warning message, click Cancel, if you don't want to go ahead with the clearing. This macro will remove all the row fields from the pivot table layout. If there are multiple Value fields in the pivot table, the Values button might be in the Row area. If so, the macro will show a message, asking if you want to remove the Values field too. 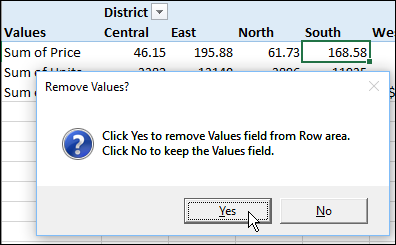 Click Yes to remove the Values field, and click No to keep it in the Row area. 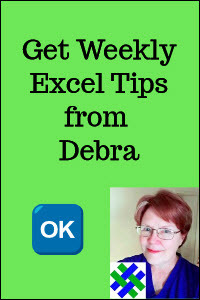 This macro will remove all the column fields from the pivot table layout. If there are multiple Value fields in the pivot table, the Values button might be in the Column area. 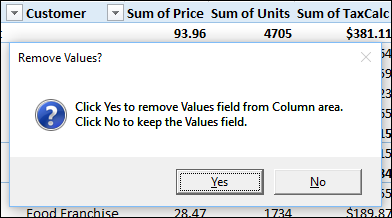 Click Yes to remove the Values field, and click No to keep it in the Column area. This macro will remove all the filter fields from the pivot table layout. 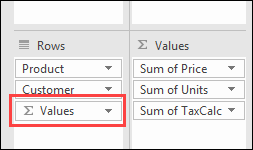 This macro will remove all the value fields from the pivot table layout. First, any calculated fields are removed, and then the remaining value fields are removed. To see the code, and to test the macros, you can download the Remove Pivot Fields Macros file. The zipped file is in xlsm format, and contains macros. Be sure to enable macros when you open the file, if you want to test the code.